The KLINGELHOFER CORPORATION specializes in metal sawing and deburring machinery. 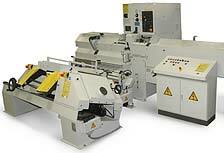 They sell standard machines, but also design unique sawing and deburring systems, the sale and servicing of saw blades, as well as contract sawing of customer’s material. They offer a wide variety of machines from fully automatic production circular saws to heavy-duty saws with optional straight or mitre cuts.